There was a wade back in July over some shallow bedrock that produced a few 17"ers, Friday I thought I had a good idea where they might winter. Already raining, I set out on foot. problem, I could see creek bottom. No fish. I thought. At the first hole I discovered crystal clear meant camouflaged fish in 3.5' feet of water. Not much light, so disguised them completely. I finally waded into them in my investigation. Pool blown, no bass. Picked a dink and a 16" free lining. I headed up to the only other hole on this stretch I knew, but the water was too fast and too deep to locate any smallmouth. I kept marching even though I knew it was all bedrock, I thought I might spy something out. Got all the way to a bridge up like a summer wade. Caught a 13"er in an eddy under a covered bridge. Now I had burned a lot of time not fishing. Headed back the mile and a half to the productive pool at about 5:15pm. 2 dinks on FnF, then a 13". 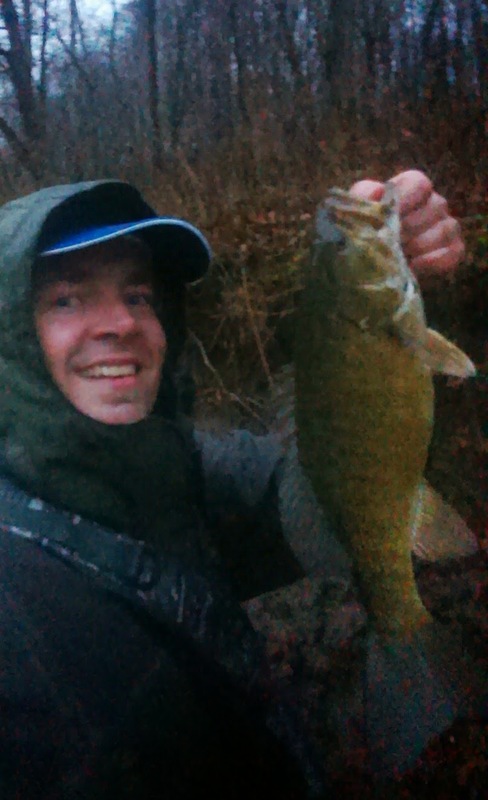 It got darker and I landed 6 more from dink to 17" and 2 big rock bass. All free lining a black fly along the bottom. The incoming storm had the fish feeding. 11 SMB and 2 Googs from that flat. No idea there were that many there. Wow. Here's the 2nd 17". Makes me wonder what could have happened had I hit some pig water instead of shallow stuff during that feed. 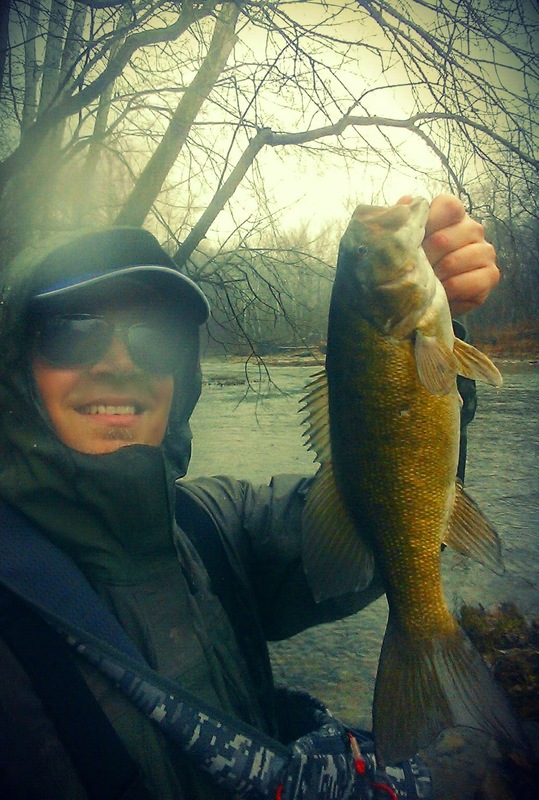 Always exciting to have success finding winter fish in an area for the first time. 13 SMB (2-17", 16", 15") 2 Rock bass 8-9"